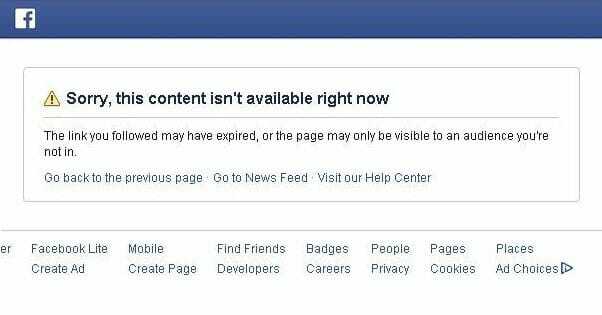 I created a new account just to use Facebook Marketplace, but it seems I've been pre-blocked from using it from my notebook PC. The icon doesn't show up on the sidebar, and when i got to the direct link "https://www.facebook.com/marketplace" I get the message in the image below about the page not available. This seems to be a problem with many people as well. When I asked why I was being blocked from marketplace in the Facebook help/questions forum, the question was shortly tagged by a mod, I was logged out and asked to upload several facial recognition pics of myself. I have an old facebook page, which I haven't logged into for several years. But I didn't want to connect it to marketplace, if there were problems. I may have to wait until my IP address changes, before I log into that account. Of course when I log out I can view marketplace. Moved to correct section of the forum. It's news to me... risky items? I'm assuming you were flagged and blocked. I was denied access to the marketplace as soon as I created a Facebook account. Didn't even list anything because I couldn't view it. New account block makes sense but I'm unsure if this is what FB is doing. It could be since it's new, no friends, pictures or activity showing it's real? Try your old account under a new IP and different device as not to link accounts. This seems to be a problem with people who have established Facebook accounts as well. Wish I knew what the algorithms are, deciding who can view and use marketplace and who can't. I wonder if Facebook also tracks the PC mac address as well. May have to sign in with a different PC. Or even if they can track the WIFI router I use. Anyone know if I can verify an account with a Google+ phone number? No website can track MAC. Not Ebay, not Amazon, not Facebook. You need new IP and virtual machine. Facebook frequently closes new accounts and has the users verify their data. Even if you apply stealth measures. Well that was fast they disabled the new Facebook account, I'm banned. So it looks like the following will be blacklisted... IP address, PC Mac address, pre-paid cell phone number, email. I'll have to log in with the old account when I think it's safe, and they can't link it to the banned account. So VM is a must huh? What's some good free VM software? May be you are creating with new account, So first verify your facebook account and then use it. Made 10+ facebook accs with different ip, computer, user. None had access to the marketplace. The only one I have access on is my main account verified with government id, but that is kind of banned as well as my items don’t rank up/ get any views. Does that mean only the account that has government ID can list items on the marketplace? If you mean posting it in groups made for selling, I don't think so. I don't use facebook often. I don't even know there is a facebook marketplace. Lot of crap for sale and for free. It's not working on pc or laptop, only on smartphone! Hi, I need an old FB account USA based. Anyone wants to sell it?